What is VIP Ultimate Body Shaping? VIP Ultimate Body Shaping is the latest, revolutionary and most advanced form of body shaping/contouring that is highly effective and gives rapid results that bring satisfaction to those undergoing it. Of what does VIP Ultimate Body Shaping comprise of? VIP Ultimate Body Shaping comprises of a synergetic combination of the action of 4 different kinds of modern outstanding technologies: 1. Endermology - mechanical tissue manipulation; 2. Laser therapy; 3. Radiofrequency (RF) therapy; 4. Ultrasound Cavitation (USC) therapy for non-surgical fat removal. What are the treatment principles underlying VIP Ultimate Body Shaping? 1. Endermologic action: vacuum and roller mechanical tissue manipulation nips and stretches fibrillar connective tissue, effectively breaks down subcutaneous fat as well as extruded capillary vessels, increases lymphatic drainage, promotes metabolism and reduces or shrinks the size of the actual fat cells and greatly improves body contouring effect. 2. Radiofrequencies' action: RF energy penetrates deeply into the connective tissue. Vacuum and the specially designed rollers manipulation leads RF to penetrate up to 15 mm in the skin and its synergistic effect with laser causes an increase in the oxygen intracellular diffusion by heating up the skin. 3. 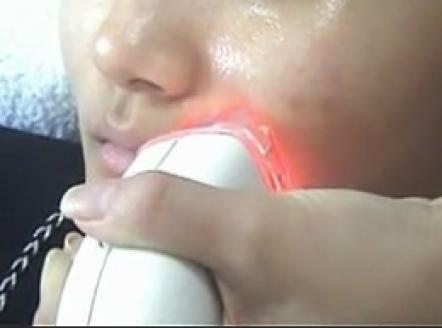 Laser energy: causes regeneration of skin cells and collagen fibers, an improvement in blood circulation and immune system response as well as an overall rejuvenation. 4. Ultrasonic cavitation with 40 KHz low frequency acoustic vibrations shake the fat cells violently, thus effectively treating the hard fat cells which finally blast as a result of formation of bubble-like cavities due to ultrasonic pressure. What are the indications to VIP Ultimate Body Shaping? 1. General obesity; 2. Localized adiposity; 3. Body shaping, especially of abdomen and hips, of women after child delivery; 4. Body shaping of men, especially of abdomen and waist/flanks; 5. Improvement of stretch marks; 6. Aiming to lose weight effectively and rapidly; 7. Black circles around the eyes; 8. 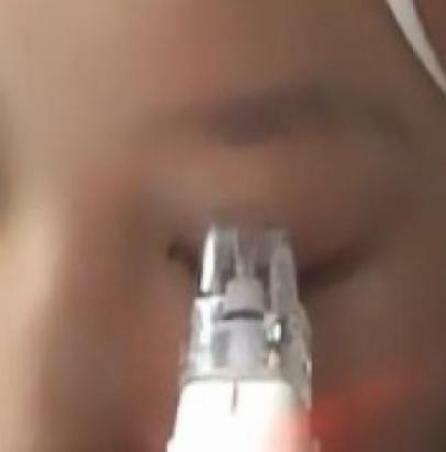 Elimination of wrinkles around eyes; 9. Lifting of upper eye-lids; 10. Elimination of pouches below eyes; 11. Alleviation of arthritic and muscular pain; 12. Whole body physical therapy. What are the usual contra-indications to VIP Ultimate Body Shaping? 1. Pacemaker and defibrillator in the body; 2. Presence of metal under the skin to be treated (e.g. metallic screws in bones); 3. Infectious skin diseases; 4. Cancer; 5. Cardiac insufficiency; 6. Serious diabetic complications on the heart, kidneys, nerves, diabetic skin ulcers, etc. ; 7. Gestational period and breast-feeding; 8. Thermal stimulus history; 9. Presence of an open wound; 10. Sensitivity to light; 11. Menses; 12. Bronzed skin due to solarization. N.B. Please note that cardiac disease and diabetes mellitus that are medically well controlled are no contra-indications to VIP Ultimate Body Shaping. Are there any complications possible due to VIP Ultimate Body Shaping? There are no complications due to this treatment. It is absolutely safe to use this equipment on the human body. Customer feels comfortable during the treatment. How long does one treatment session take? A localized regional treatment session takes 15-20 minutes, depending on the surface area of the zone as well as the degree of the skin anomalies and fatty tissue characteristics. A whole body treatment session takes 45-60 minutes, again depending on the total body surface area to be treated as well as the degree of the skin anomalies and fatty tissue characteristics. How many sessions are done in one course of treatment of VIP Ultimate Body Shaping? One needs to start with a course of treatment that contains a minimum of 10 sessions. After having completed the course of 10 sessions, an assessment will be made if one needs more sessions and, if such is the case, then an evaluation can be made as to how many more sessions would be needed. 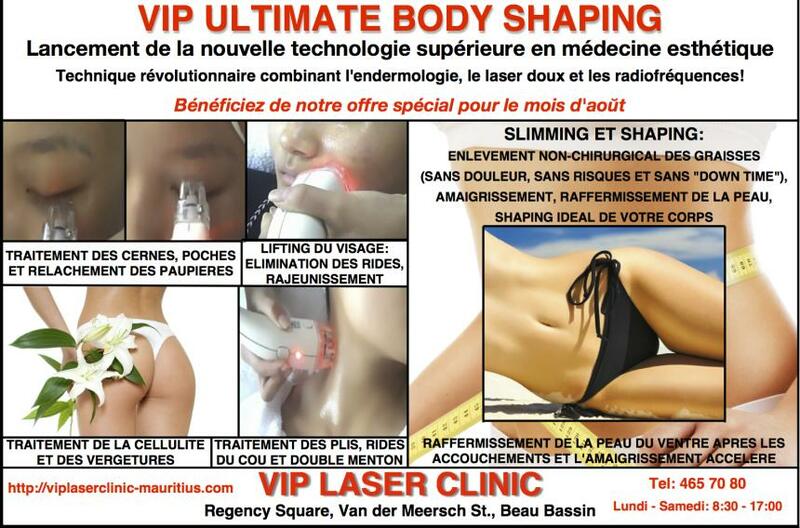 How is a course of treatment of 10 sessions of VIP Ultimate Body shaping carried out on a localized body region? Localized body region treatment is performed twice per week, each treatment session lasting for around 10-20 minutes. How is a course of treatment of 10 sessions of VIP Ultimate Body shaping carried out on a full body? Full body treatment is performed twice per week, each treatment session lasting for around 45-60 minutes. How is a course of treatment of 10 sessions of VIP Ultimate Body shaping carried out on the eye-lids? Eye-lids contouring treatment is usually performed once per week, each treatment session lasting for around 10-20 minutes. Which changes can be noted in the patient's condition after VIP Ultimate Body Shaping? After a complete comfortable treatment, the patient's urinary output usually increases as VIP Ultimate Body Shaping promotes the activation of adipose (fatty) tissue metabolism, whereby the dissolved fats are evacuated by the lymphatic system of the human body. Why does the patient feel a sense of hotness from inside his body? VIP Ultimate Body Shaping has bipolar radiofrequency (RF) technology incorporated into its system, which exhibits a working depth of 5-15 mm subcutaneously. Heat elimination is slow; therefore the sense of hotness normally lasts for 1/2 an hour to one hour. What are the precautions to be taken after the VIP Ultimate Body Shaping procedure? Avoid direct sun exposure and intense sun bath. Can the female patient undergo VIP Ultimate Body Shaping during her menses? The female patient should better avoid receiving VIP Ultimate Body Shaping during her menses as her feeling of pain and sensitivity is high and her body resistance is weak. Is the effect different according to different skin? Yes, normally the effect is different according to different skin. Usually the effect on oily skin is more obvious than that on dry skin. The fibers of dry skin shrink badly. So, it is necessary to replenish dry skin with water; that improves the treatment effect. Can a patient with injectable fillers in the face go through the VIP Ultimate Body Shaping treatment? Injectable fillers do not stand high temperature. So, it is better for such patients to avoid VIP Ultimate Body Shaping for the face. Can a patient with silicon gel undergo the VIP Ultimate Body Shaping treatment? No, because the silicon gel gets easily out of shape as soon as it absorbs heat. Can a patient with golden thread implantation undergo the VIP Ultimate Body Shaping treatment? You need to try on a small area and observe the changes occurring for some time. Can a patient with porcelain undergo the VIP Ultimate Body Shaping treatment? It depends on the endurance capacity of the customer. Can a patient with metal in his/her tooth/teeth undergo VIP Ultimate Body Shaping treatment on the face? It depends on the endurance capacity of the patient. Many people with strong endurance capacity could accept the VIP Ultimate Body Shaping treatment by putting a cotton swab on the area being treated. Can a patient with allergic skin undergo VIP Ultimate Body Shaping? Can a patient with facial neuritis undergo VIP Ultimate Body Shaping? No, because such a patient cannot stand any stimulation. Can a patient undergo VIP Ultimate Body Shaping and Intense Pulsed Light (IPL) treatment at the same time? No, VIP Ultimate Body Shaping and IPL treatments cannot be done at the same time. It is better to undergo VIP Ultimate Body Shaping 7 days before or after the IPL treatment. After how long after a wound healing can a patient undergo VIP Ultimate Body Shaping? Depending on the depth of the wound, it normally takes one to three months after a wound heals before one could undergo VIP Ultimate Body Shaping. What is the feeling during VIP Ultimate Body Shaping treatment on the eyes? The eyes do feel hot. This sensation of hotness disappears in some 20-30 minutes. What can one expect after a treatment session on the eyes? Usually the black circles around the eyes and the wrinkle of the canthus are improved. Canthus is lifted. Few people have mild oedema - this is normal and this oedema disappears in 2-3 days. What is the effect after treating eye bags/pouches? Pouches contain fatty, oedematous and slack tissues. The effect on fatty pouch is slower than on an oedematous pouch, for which the effect is fastest and most obvious. The obvious result appears after one to three treatment sessions. Can treatment be performed on wrinkles of upper eye lids? 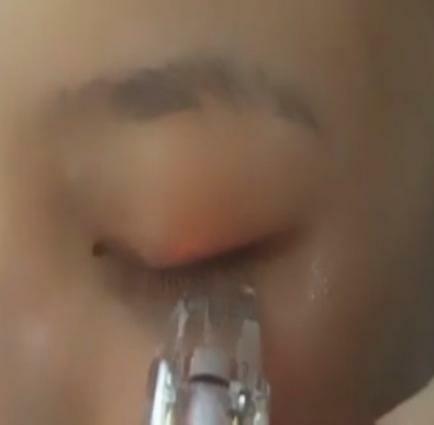 Yes, treatment can readily be performed on upper eye lids. This is the biggest advantage of this equipment. What's more, one can obtain a very good effect.